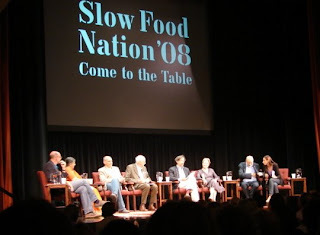 Thanks to FORA.tv and Slow Food Nation, the panel discussion I attended during the SFN'08 event has been made available online. This panel is a who's who of the slow food movement, and I found the discussion to be fascinating on several levels. The passion of the speakers is undeniable, their dedication to the mission is unquestioned, but beneath it all is a nagging frustration at not being able to fully answer the skeptics charges about how this "good, clean, and fair" food revolution will really take hold. I left the lecture with almost as many questions as answers, but I also left with a smile, wondering how long it would be before food changes us, instead of the other way around. This was a long discussion, so FORA.tv broke the video into two parts. This is part one. Enjoy! I know that this is totally unrelated to the video, but can you please make a demo on how to make a perfect flour tortilla? Slow Food is a pretty cool movement. I think it is great that it encourages people to prepare food by hand the good 'ol way rather than eating everything from a processed state. Food just tastes so much better that way - and as many of your videos demonstrate, making quality meals doesn't have to be difficult whatsoever. So, it's something we can all take part in. That's significant.